For small, stable systems, when the modular design, single-slot expansion and port-customization power of Sangoma’s A100, A200 and A400 series is not required. 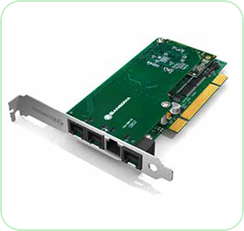 The Sangoma B601 voice cards deliver customers a substantial cost savings by integrating on a single PCI or PCI Express slot both digital and analog interfaces. This, coupled with the “Because it must work” quality and the Wanpipe® high-end system diagnostics, drivers, and utilities for which Sangoma is known worldwide. Your customers can achieve optimum echo-cancelled voice quality and enhancement with telco-grade DSPHardware Echo Cancellation. One DSP echo canceller on the B601D or B601DE voice card provides telco-grade hardware echo cancellation on all channels with no additional CPU load and minimal additional cost. Ideal for small or home offices, Sangoma’s industry-leading hybrid FlexBRI solution will seamlessly integrate youranalog fax machine with your BRI phone system, using only one PCI or PCI express slot and will fit in even the smallest 1U servers. 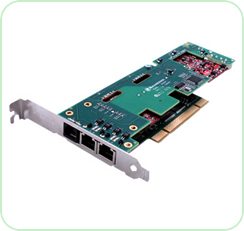 A single PCI or PCI Express slot hosts the connection for up to 4 ports of BRI and 2 ports of Analog FXO or FXS and ensures common synchronous clocking for all channels with absolutely no signaling issues. The card is 100%software configurable.